Hartman scored the game’s first goal at 11:07 of the opening period. 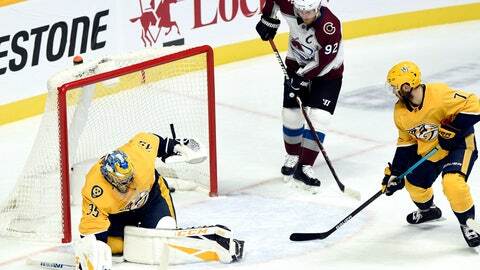 He sent a wrist shot from the left point toward the Colorado net that went off the skate of Avalanche defenseman Samuel Girard’s right skate and by a surprised Varlamov. Girard, playing against his former team, picked up the secondary assist on both of MacKinnon’s goals. NOTES: Nashville fell to 13-1-0 when scoring first. … After not allowing a power-play goal in five consecutive games, the Predators have given up three in their last two games. … Colorado has won five consecutive road games. … MacKinnon has points in five straight games (five goals, six assists).